Feline leukemia is a condition caused by the feline leukemia virus (FeLV), a highly contagious retrovirus that affects cats. The Ashton Animal Clinic describes FeLV as the "leading viral killer of cats". Unfortunately, many pet owners are not aware of this virus and its risks, which allows the illness to progress undetected. Vaccines for FeLV are available, but they are not a full guarantee of immunity. Nor are such vaccines without their own potential risks. When it comes to life-threatening viruses, prevention is the most important step towards maintaining your cat's health. FeLV is a retrovirus that creates an enzyme which can insert copies of the virus' own genetic material into the cells of its host. This makes for a very tricky foe. According to Cornell University's College of Veterinary Medicine, one of the more interesting aspects of FeLV is that it is not an automatic death sentence. Much like the Feline Immunodeficiency virus, FeLV can either slowly or quickly break down the immune system of a cat. A cat's longevity will, therefore, depend largely on its genetic strength and an environment that is conducive to optimal health. 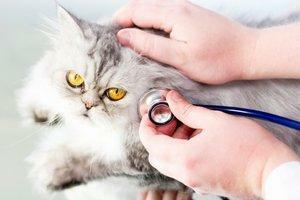 This is good news for pet owners who experience an initial shock over their pet's diagnosis. First of all, some cats will naturally work the virus through their system during the first viral stage called primary viremia. Should their immune system be strong enough to attack the virus head on, they will recover and experience a life-long immunity to FeLV. Cats that carry the virus into the second stage, secondary viremia, will not be so lucky. The virus will remain within their systems for the rest of their lives, making them predisposed to all sorts of pathogens and health conditions. Cancer and immune deficiency are also commonly experienced by cats with FeLV. Kittens, elderly cats and cats who already suffer from an underlying medical issue are the most vulnerable to FeLV. Those who are in the secondary stage of FeLV require special treatment and safe environments in order to maintain a higher level of health. A weak immune system lays a cat open to all sorts of bacterial infections, secondary infections, fungal invaders and even an overgrowth of pathogens that are naturally found in the feline system. A clean, isolated environment is vital for cats who carry FeLV. The most important step towards supporting your animal is to keep it indoors and away from any other felines. This is every bit as important for protecting your cat's health as it is for protecting any other nearby cats. Research and statements by The Humane Society emphasize that indoor cats live longer, healthier lives than their outdoor counterparts. This will be particularly true for cats with FeLV. In fact, your cat is infinitely less likely to contract FeLV if it is an indoor animal with minimal to no exposure to other felines. The virus sheds easily through mucus, feces and saliva. The great outdoors can do little to prevent its spread. An outdoor cat that is already infected with FeLV is now susceptible to the hordes of other communicable diseases and pathogens present in the wild. Injuries are a particular concern for infected animals. A simple scratch or animal bite can develop into a severely infected wound due to an inadequate immune response. Keeping your cat indoors and feeding it a balanced, low-toxin diet will do wonders to promote your cat's longevity. Researching cat diets that offer a well-rounded approach alongside nutritional supplements may also help to boost your pet's immunity. There are many brands of organic or preservative-free cat foods available on the market. If you lack the time or confidence to explore homemade meals for felines, organic and natural brands are the next best step. The FeLV vaccine is not used to treat infected animals. It is a preventative measure for animals that have not yet been exposed. The FeLV vaccine serves to boost a cat's immunity to the virus and is typically administered to kittens. This vaccine is given during several tightly scheduled veterinary visits, so you will want to adhere strictly to the FeLV vaccine protocol in order for your cat to achieve the best degree of immunity. The FeLV vaccine is not without side effects. VetInfo.com reports that one of the more common and severe effects of this vaccine are cancerous tumors called sarcomas. Sarcomas will often appear at the injection site, and these tumors are not easy to treat. Since the FeLV vaccine is not without its own risks, you can actually lessen or eliminate your cat's need for this inoculation by keeping your animal indoors. An animal that remains indoors and has no contact with other animals experiences an almost non-existent threat of FeLV. To provide your cat with the very best level of feline health protection you will want to keep kitty indoors and discuss the need (if any) for inoculation with your veterinarian.